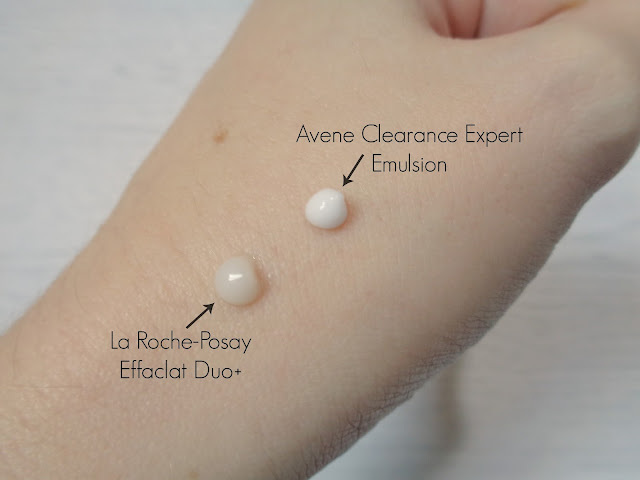 As you may know I'm a big fan of La Roche-Posay's Effaclar Duo + and until recently I'd used it every single day since I first purchased it back in early 2014. The reason I have stopped using this recently is because I've been trying out a similar product from Avene called Clearance Expert Emulsion*. 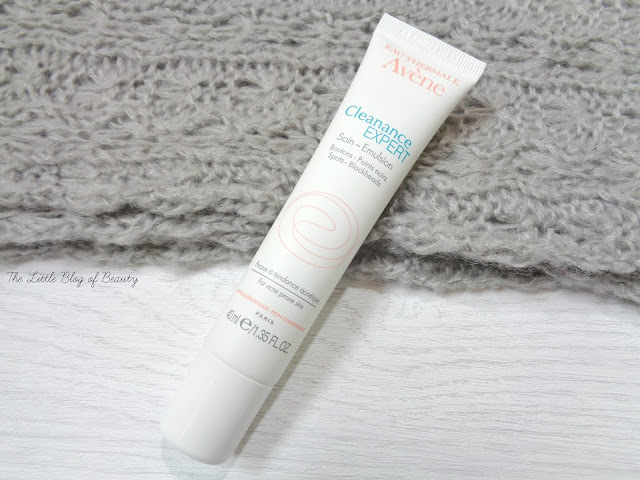 Avene Clearance Expert Emulsion is described as a unique daily treatment to help prevent and treat adult acne, but I personally think this is quite a similar product to Effaclar Duo +. I certainly use them both in the same way. Clearance Expert regulates the production of sebum (oil), mimics the skins natural exfoliation process without the use of acids, limits the spread of acne causing bacteria and helps to eliminate spots and blackheads. The main difference in terms of what the product does between this and Effaclar Duo + is the latter does make use of acids for improving skins texture and also contains something called Procerad, which rebuilds the skins surface and helps to reduce the inflamation, scaring and hyper-pigmentation that spots and breakouts can leave behind. There is also a difference in the look and feel of each product. I would consider Effaclar Duo + like a serum and would use a moisturiser over the top, whereas Clearance Expert is more like a moisturiser and I usually use a serum or facial oil underneath. Both products do contain fragrance but I can only really detect this in Clearance Expert and it only really smells like a cream/moisturiser, if you understand what I mean. At first glance Clearance Expert appears to contain alcohol, but this is Cetearyl alcohol, which is actually a fatty/waxy alcohol known to condition and soften the skin. Please ignore the typo on the picture above (Effaclat!). It was only after I'd deleted the original image that I spotted it *head desk*. I'm not sure if this is important but I will mention that I don't use either product all over my face. Although I do get the occasional spot on my forehead, around my nose or maybe on my cheek, it's hormonal and stress related breakouts on my chin that I regularly suffer from. So both products I use as a targeted treatment just on my chin. Just as I started using Clearance Expert I developed a lovely cystic spot that always pops up in roughly the same place on my chin. Although it did take at least seven days for this to subside I was really pleased to see that when the actual spot cleared the lump and discolouration it left behind, which would usually take a few weeks to clear, actually disappeared very quickly. More recently I suffered a pretty bad breakout across most of my chin. I don't know why but I'd been experiencing hormone problem for two weeks before I even hit that time of the month, so I'm not surprised this really affected my skin. In the end I did have to turn to my prescription treatment but once the worst was over I returned to using this and it did a good job of helping to clear up what remained of the breakout. The marks from the larger spots haven't cleared up as quickly this time but the skin where the smaller spots were has recovered well. I've found that if I have one or two small spots or a light breakout this does a good job of helping to treat it and prevent it getting worse. Although as I mentioned, and is also the case for me with Effaclar Duo +, if the breakout is bad enough I will have to transfer over to using my prescription treatment to bring it under control. I really like both products and would happily consider using either. They're both almost exactly the same price at £15.50 for Effaclar Duo + and £15 for Clearance Expert, so for me personally it would probably boil down to grabbing the one that's on offer, or maybe Effaclar Duo + because that's the one I've used longest. Although I'm a fan of Effacalr Duo + I know a lot of people find that it doesn't work for them, so if you're one of those people I'd recommend giving Clearance Expert a try. Avene Clearance Expert Emulsion is available from Escentual. Have you ever tried either of these products? Hmm, I'm pretty loyal to LRP and I doubt I would purchase this one from Avene for that reason - if it ain't broke, why.. buy something else? Great review lovely.